This is an update on the work of Anthony Hawley, carried out during his time in Gozo in 2017. During the weeks before the 2017 presidential inauguration, I was preoccupied with what forms of action and engagement to take. I came up with “Drawings for Donald”—a drawing a day for the next 365 days. These began as text-based drawings, ink on paper, each text starting with the words “Dear Donald.” My intention was that they were sometimes funny, often odd, occasionally topical, and that they possessed some poetic intrigue. I wanted these to haunt Donald, to haunt us all into another place; to haunt us out of now. About two months into the process, a shift occurred—I started drawing on darkroom works I created. After using several different images, my drawing surface became a photograph of the Skorba Temples in Malta—the spare remains of monolithic stones from thousands of years ago. Most days now, I try to use a slightly different version of the Skorba image for my “Drawings for Donald” — manipulated, tweaked, collaged, underexposed, overexposed, etc. The daily repetition of the image helps reflect the uncharacteristic compression of the real, the fake, the truths, and lies. Part of what interests me is the question of what an image can store. How can it expose buried spaces that are daily being shoved aside? How can a broken image open up other kinds of seeing? How can it make room for all the spirits and hungry ghosts? As our language gets stripped of its nuances, niceties and niches in this current time, we need to keep it supple. If we aren’t custodians of words and images, who will be. It was another windy day. We climbed Ta’ Għammar Hill near Ta’ Pinu church and reached the amphitheatre at the peak. We competed with the wind to create sounds to accompany our first filmed ritual. Luckily there was no clash with the tourists at this time, and we had the amphitheatre to ourselves. We were exhausted from the performance. It felt like we had just spent a day at a very rough sea. We’ve spent the first two days foraging and walking. We visited the free-standing Megalithic structures and walked from Għarb to Dwejra, to see the ghost of the Azure Window. Tomorrow we start our first ritual in Għammar, near Ta’ Pinu. It is our third day in Gozo, and the winds are still very strong. We have decided to not resist the wind, and allow it to be another performative element in our first ritual ahead of our procession. 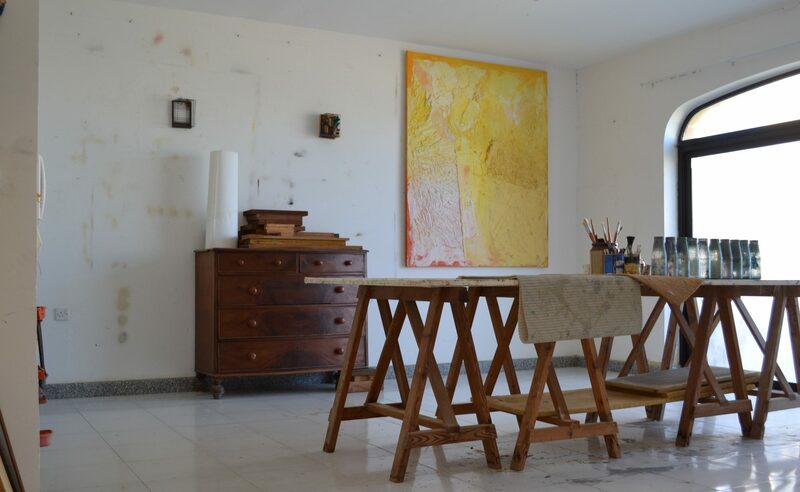 The call for artists to take part in the Artists’ Residency during 2019 is now open. Have a look at the new Programme, and the four strands within it. The call is open until 31 May 2018. The Azure Watch: Office for Public Memory reimagines The Mill as an Orwellian public record office that stores memories of the Azure Window: a space in which images, artworks and souvenirs of the site have been transformed into mass consumable public iconography. This memory store displays its collection of commodities as museum artefacts, souvenirs, memorials and as distorted memories; their context inviting visitors to reconsider the iconographic artifice of the Azure Window as it once stood and as it stands now. Patriots, engagez-vous! Azure Watch: Office for Public Memory is making a call to all artists to reimagine the national icon that is the Azure Window. Your plans and proposals to interpret concepts of built heritage, monumental heritage, nostalgia, collective memory and the reconstruction, deconstruction, destruction and decomposition of our local environment can help save our image of the Azure Window for the future. Submit them now! Proposals may include, exclude, or transclude – and are not limited to, or by – public installations and interventions, sculptures, performances, virtual and augmented reality, physical art, digital art, or even impossible art. Spazju Kreattiv will select from these proposals and develop them with you in their programme later in the year. Are you between 13 and 17 years old? Would you like to take part in a dance and movement project in Gozo? Dancer Gdalit Neuman, with Spazju Kreattiv, invites young people to join her workshops between the 1st and the 12th of May 2018 during her Gozo Artists’ Residency. Join us on a fascinating journey! Using movement techniques we will explore issues that are important to you! What makes you unique as a young Gozitan person? How do you see yourself as a citizen of Gozo, Malta, Europe, the world? What are your aspirations for the future? How is your generation unique and different from that of your parents or grandparents? What traditions do you hold dear and which ones are no longer relevant to you?We want to hear from you, and dance with you – No dance experience is required! Gdalit Neuman is a Canadian-Israeli dancer, choreographer and educator. She has performed with the Rina Schenfeld Dance Theatre and The Israeli Opera, has choreographed independently both in Israel and Canada, and has been on faculty at Canada’s National Ballet School and York University’s Department of Dance in Toronto. Azure Watch was recently exhibited at Federico Bianchi Contemporary Art in Milan within a collective exhibition called Perché non sono riuscito mai a nuotare ho deciso di volare.